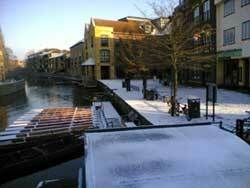 The river Cam wends its way through the heart of Cambridge. A tidal river, for centuries it was the lifeblood of the city, bringing waterborne trade to the heart of the settlement from Roman times right up to the building of the railway in the 1800’s. The river within the city is divided into 3 stretches – the upper river, also known as the Granta; the middle river, known as the Cam and also more famously as the Backs; the lower river where the Cam continues on its journey North out of Cambridge towards Ely. Gradually over the centuries various Cambridge colleges purchased or were bequeathed land by their founders in the centre of the city, and on the flood plain adjacent to the river, forming the Backs and the now famous sights that draw millions of visitors each year. A direct consequence of this was the restriction of public access along the ¾ mile stretch that runs through the city centre, public access which is now limited to a few locations. The Cambridge City council’s current proposals will stop independent punt operators from using any council owned land, specifically Jesus Green but also any other land that may be used, for loading and unloading of customers. Enforcement is due to start before Easter weekend 2008 (Good Friday is 21st March) despite the fact that there is no alternative being made available. The council have also stated that anyone who continues to use Jesus Green will get a ‘black mark’ against them and jeopardise their potential to get a slot at the La Mimosa station.